Greetings all, 2019 started off really good for heat management unit systems. We are seeing a lot of new products in the industry and most of them are unique and interesting. 2 heat management from hookah industry giants emerged and we have both of them to compare what is new and what has changed from previous iterations. These 2 products are Lotus V2 from Kaloud and NarHead from Starbuzz. Both of them has distinct designs and are pleasure to look at from the standpoint of style. But what we are concerned about is how they perform. So without any hesitations lets jump right in and compare the 2 new systems. First off we have Lotus V2 by Kaloud. Kaloud is a California Based company that is known for their innovative heat management units. It all started with V1 which shaped a future of hookah industry and Brough convenience to those who are tired of using foil on their hookah heads. Then came an updated version which is Lotus Plus. Plus version is a bigger lotus which fits 3 charcoals easily for increased heat output. Some years later we see Lotus V2, next generation of heat management unit with interesting design. This time around, Lotus decided to ditch the conventional lid with air slots and created a lid that looks like a dragon egg shell that covers the base(which changed dramatically). The base this time is not just a cylinder type charcoal holder. This time it is shaped as a crown. The question is does any of these changes bring more functionality? Unfortunately, not. In our experience it was harder to manipulate the heat management unit due to the new design. Sometimes the looks are not everything. Somehow, Lotus lost its convenient way of handling due to the new shape. The lid can only be removed by a provided lid handle which is detached and can be easily misplaced. The base has more pronounced tabs in it so the part of the charcoal that lays on the surface has a place underneath for charcoals to breath. This reduces the blackout of charcoals. It would be great to see a previous generation of Lotus with these features since V1 has flat bottom. This problem was taken care of in Plus iteration so it is a plus(pun intended:D). Next up, we have NarHead by Starbuzz. 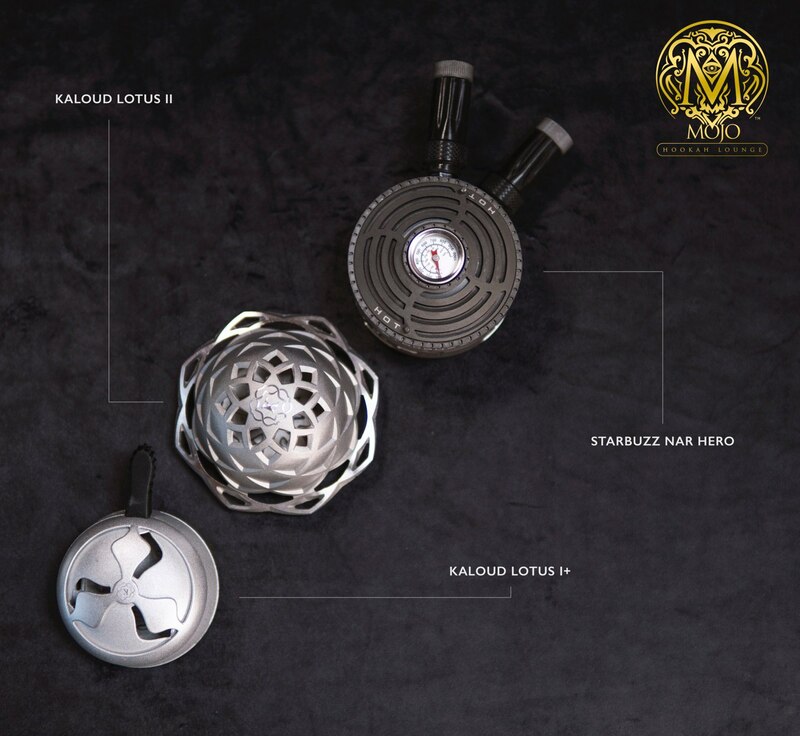 This is a first attempt of Starbuzz to bring their own heat management unit in the industry. NarHead has a design that is taken out of the military base. At least that what we thought it looked like. It might look great on top of Starbuzz’s own hookah “Carbine”. It has built in thermometer to provide information on what is the temperature inside of the HMU. It also has 2 handles that can be detached(we recommend detaching a handle from the base part). The air slots on the NarHead can be opened fully wide to drop the temperature at the shortest time. Unfortunately due to the thickness of the HMU it takes forever to heat up. In our test we left the bowl for almost 10 minutes to heat up, and the result was lacking at best. This HMU is also on the heavier side so be careful if you use a shorter hookah with a narrow base as it gets top heavy. The new 2 heat management units are definitely interesting iterations of the beloved Lotus. While both of them are unique and bring new features for us to digest, unfortunately 2 of the systems feel raw at the moment with a lot of shortcomings in functionality. Lotus has beautiful design but lacks in basic convenience features that we are so used too. NarHead has a lot of new features but implementation is poor at the moment(we are hoping for v2 or even v1.5 that fixes the problems). As of right now it is better to stick with the previous generation products since they bring great functionality and better value with the upcoming price drops.